One pot dinners are fast, easy and packed full of flavor. This “meat and potato” dish has a little bit of everything and something to please everyone. It is kind of a home-style comfort meal that I think you will enjoy. 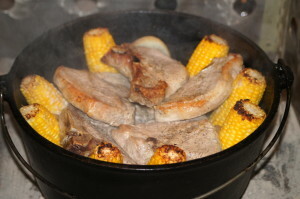 Season pork chops and brown in a hot Dutch oven, then remove to a separate dish. Next, line your oven with the corn, standing on end (I used a 12″ deep oven). Then layer the carrots, onions and potatoes in the center. Spoon the soup over the top of the potatoes. Place pork chops on top. Cook for one hour to an hour and a half, depending on the thickness of your chops. Bake at 350 until the chops are tender and the veggies are cooked though, replacing coals as needed. One pot dinners are fast, easy and packed full of flavor. This "meat and potato" dish has a little bit of everything and something to please everyone. It is kind of a home-style comfort meal that I think you will enjoy. 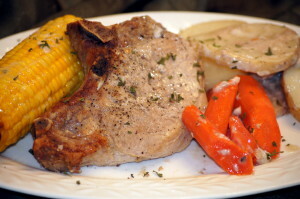 Season pork chops and brown in a hot Dutch oven, then remove to a separate dish. Next, line your oven with the corn, standing on end (I used a 12" deep oven). Then layer the carrots, onions and potatoes in the center. Spoon the soup over the top of the potatoes. Place pork chops on top.